There are literally hundreds of different supplements available. From protein supplements to pre-workouts and fat burners. Whatever your goals there is a supplement that can help you achieve them. If you are bulking you will need to look for an appropriate bulking supplement, but which one should you choose? Luckily for you we have done the hard work for you, going through the various options and listing our top choices below. Please continue reading to discover our best bulking supplements of 2019. When you undergo a bulk you are trying to gain muscle. During this process you will increase your intake of calories, while maintaining your usual intense training regime. A bulking supplement can increase your ability to build muscle, usually because these supplements contains various ingredients and nutrients that can make up any nutritional deficiencies from your diet. How to Choose the Best Bulking Supplement of 2019? Like we said already, there are hundreds of supplements available that make numerous claims. Unfortunately not all of them are as effective as they are claimed to be. The most effective way to check if a bulking supplement works as claimed is to see what ingredients it uses. That means you will need to check its label. If a potential supplement does not even have a label, then it is probably best avoided. If you do not know what it contains, how will you know what effect it will have on you? Bulking supplements can speed up your gains, but you should never overpay for a supplement. Have you got a budget? If so then you should try to stick to it. I would recommend avoiding trial offers if I were you. They may seem tempting, but the truth is that most end up costing considerably more than you would expect. Again, to check that the bulking supplement is safe you should spend a little time researching its ingredients. If you are in any doubt then I would recommend speaking to your doctor. Also, to minimise any potential risk always follow any dosage instructions to the letter. Sometimes you will want to ask questions about a prospective supplement before you order. If there is no contact details, how can you do this? What about if you have an issue with your order? I would recommend avoiding companies that do not have any form of contact information. Products that have money back guarantees are often the best option in case the product you have chosen is not quite right. Most products nowadays offer these guarantees, and you should ask yourself what is wrong with a product if it doesn’t. D-Bal Max is a relatively new option but since its release has made a massive impact. It contains a variety of proven ingredients that can significantly boost muscle and strength gains during a bulk. These ingredients include 900 mg of whey protein concentrate, as well as BCAAs like Isoleucine, Valine and Leucine. This can help increase strength and endurance while lifting, and can help reduce recovery times too. 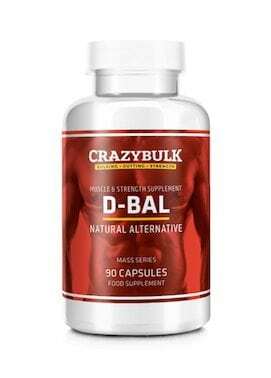 Other ingredients found in D-Bal Max include 2-(carbamimidoyl-methylamino) acetic acid, a highly absorbable form of creatine, and 20-Hydroxyecdysterone, a plant steroid. The 2-(carbamimidoyl-methylamino) acetic acid can helps deliver energy to your muscles via ATP, which is a key process used in protein synthesis. 20-Hydroxyecdysterone helps promote muscle growth, can increase endurance and cut fat. D-Bal is a safe and natural alternative to the banned anabolic steroid Dianabol. It has been created by Crazy Bulk, a manufacturer based in the USA that produces numerous pharmaceutical grade steroid alternatives. D-Bal’s formula includes whey protein concentrate, BCAAs like Isoleucine, Valine and Leucine, as well as the testosterone booster Tribulus Terrestris. These ingredients when combined will help increase protein synthesis and nitrogen retention. This in turn will help increase muscle mass, strength and gym performance. HGH-X2 is made using a mixture of amino acids that will help you gain lean muscle mass. 2-Amino-5-Pentanoic Acid is one of the best amino acids that will help release growth hormone into your blood. It can also maximise nitric oxide production for greater pumps. HGH-X2 also contains Macuna Pruriens, which can help boost both testosterone and growth hormone production, as well as aiding your sleep, which also benefits testosterone production. Maca Root is also found in this formula, which will boost your power and focus while working out. This bulking supplement is claimed to be 7x more anabolic than testosterone, with a study showing that the same formula used in this supplement helping users to gain an impressive 8.8 pounds of muscle in just 30 days. DBol-GH is a natural, yet powerful bulking supplement that is claimed to increase HGH levels, which will result in an increased ability to build muscle. It contains a host of BCAAs, plus ingredients like Bovine Colostrum that can help trigger IGF-1, a key factor in muscle growth. Beta-Ecdysterone is another ingredient found in DBol-GH. This ingredient has been statistically proven to increase mass and muscle protein. Andro the Giant is a bulking supplement that contains 4-Androsterone, an anabolic bulking agent that converts into testosterone during a two-step process. Another bulking supplement named after the popular anabolic steroid Dianabol. It offers similar benefits to the steroid thanks to its formula containing the following ingredients; Cyanotis Vaga, Fenugreek, L-Arginine, L-Inosine and Rhodiola Root. Cyanotis Vaga is a plant steroid that can boost protein synthesis, Fenugreek can boost testosterone production, L-Arginine and L-Inosine can fuel your pumps, while Rhodiola Root can prevent muscle loss and aid muscle recovery. A bulking supplement made from natural ingredients that include Epicatechin (found in green tea and cocoa) and Laxogenin. Using this supplement will aid your bulking efforts thanks to its ingredients (Epiandrosterone, 1-Androsterone and 4-Androsterone) helping to increase your natural testosterone levels. Super DMZ Rx 5.0 by IronMag Labs is made from an unique formula that contains a range of ingredients that will aid your bulking efforts, these include Epicatechin and DHEA. This can help increase strength and ensure you see an increase in muscle mass. Other benefits that you can experienced through the use of this supplement include harder muscles and an increase in vascularity. While using a bulking supplement like one of those chosen above will help speed up your results, you should understand that supplements are not a replacement for your own hard work. If you want to build muscle and strength then you need to train with dedication, while ensuring your diet meets your nutritional needs. Of course using a supplement like D-Bal Max alongside a protein-rich diet and regular training is recommended. Remember, its ingredients can help to increase strength and endurance while also helping to reduce recovery times as well. Will check out your recommendation. What about your fave whey protein? Supplements can only do so much imo. Your diet is so much more important!! Will check out your suggestions.